The first classic of the season, Milan San Remo is always an exciting affair, pitting the top riders against each other in a battle of fitness, tactics and luck. At 291 km (180 miles) Milan San Remo is the longest single-day race on the World Tour calendar. The sheer distance and lumpy finish present problems for the top sprinters while those same elements present opportunities for the escape artists who dream of a solo breakaway. Heading south from Milan, the course hits the Mediterranean coast and follows it all the way to San Remo. Relatively flat terrain make the first 150 miles relatively straightforward, and there is often an early breakaway that is allowed to go up the road. The final 30 miles have several short climbs that each play a decisive role in the race outcome. Much of the focus is on the Cipressa (5.6 km at 4.1 percent) and Poggio (3.7 km at 3.7 percent), but there are also the Capo Belle, Capo Cervo and the Capo Berta, which all precede the two more well known climbs. After six-plus hours in the saddle, any climb taxes the legs at an exponential rate. Team Cannondale-Drapac allowed us to take a look at the power from Will Clarke, who got in the day’s main break and kept the field at bay for more than six hours. Team Director of Performance Keith Flory also gave his insights into what it takes to perform well at Milan San Remo and his assessment of Clarke’s big day in the saddle. It’s not only about sheer power and ability. The descent off the Poggio is technical, and once down, riders still have about 3 km to cover to get to the line. As Flory points out, a good descender can expend less energy and possibly gap a poor descender, or at least force them to put in more efforts than they’d like. 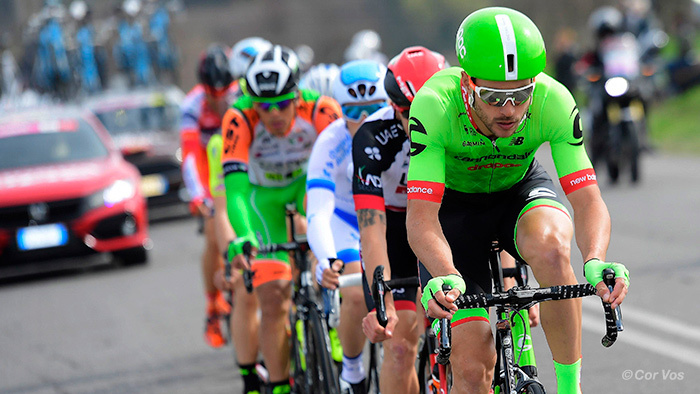 Team Cannondale-Drapac riders were ready to get in the break. As soon as the flag dropped to start the racing, Clarke and his teammate Toms Skujins—both in their first Milan San Remo—got in the 10-man group. The gap was up to five minutes at one point, though the peloton was not truly chasing until later in the race. “Whilst they had to focus for the first 10 minutes to build a lead, it was obvious that the peloton were happy to let this go,” said Flory. The escape group worked well together, toward the end the fatigue showed in all the riders. Riders in the break began to falter, whittling the group down to a final three, which included Clarke. It wasn’t until nearly seven hours and 265 km later that the peloton swallowed them up during the ascent of the Cipressa. At the start, 10 riders broke clear to form the day’s breakaway. Clarke produced his Peak 20-second power of 784W (9.42W/kg), Peak 30-second power of 662W (7.96W/kg) and Peak one-minute power of 545W (6.55W/kg) just to get into break. This was less than 20 minutes into a race that would last more than 7 hours. After 6:30 in the saddle, Clarke starts to hit several of his Peak Power values. In the course of 30 minutes from the Capo Berta to the Cipressa he hits his peak 2, 5, 6, 10, 12, 20 and 30-minute power values. His Peak two-minute power of 517W (6.21W/kg), Peak five-minute power of 474W (5.7 W/kg) and Peak six-minute power of 449W (5.4W/kg) values come leading into and ascending the Capo Berto. His Peak 10-minute power of 396W (4.76W/kg), Peak 12-minute power of 387W (4.65W/kg) and Peak 20-minute power of 371W (4.46W/kg) all occur leading into and then ascending the Cipressa. This 30-minute section is also his Peak 30-minute power of 355W (4.27W/kg). From the start of break to his catch at Cipressa, Clarke rode for 6:32 at 301 NP, 260 AP (3.13 w/kg), and averaged 24.9mph. Ride Totals: 7:16:48, 301 NP, 259 AP (3.1W/kg), IF .68, 24.7 mph, 91 rpm, 6,774 calories, 340 TSS. Take a look at Clarke’s race file here. AJ Johnson has been a USA Triathlon certified coach for more than 15 years and is also certified by USA Cycling. He has worked with hundreds of triathletes and cyclists, from beginners to professionals, to help them achieve their goals. His coaching and training plans are designed to provide a balance between training and the needs of every day life so athletes can achieve their best and enjoy their journey. Find out more about his coaching options and training plans.